Running low on finances this Valentine’s Day? Here are some things you can do for the perfect Valentine’s Day without busting your finances. With Valentine’s Day just around the corner, there are tons of ways to celebrate the day; some more expensive than others. But even if you’re low on cash, worry not. Here are some simple tricks to cut back on the expenses, while still having a great time. If like most people, you use a digital wallet to make all your payments, you could be in for some discounts and offers. From movie tickets to restaurants, online shopping sites to travel, most digital wallets have cashback and discounts which you can use to your advantage. So, whether you want to stick to the clichéd, but romantic ‘movie-and-dinner date, or take a mini-holiday on Valentine’s Day, you can probably do it without burning a hole in your pocket. Dinner dates and movies are quite popular, and they are also somewhat ordinary. Instead, do something more offbeat and less expensive, while still having a great time. Visit a museum, art gallery or planetarium; tickets to these are quite affordable. Or take a morning hike, followed by breakfast at your favourite place, or just drive to a quaint place out of town and spend an evening stargazing. All of these are budget-friendly options that will make for a truly memorable day. Most banks offer their customers special discounts and offers on their credit and debit cards for purchases, restaurants etc. For instance, some banks have tie-ups with restaurants, providing their patrons with up to 10% -15% discounts on bills. So, why not try out that fancy, fine dining restaurant that you both have been eyeing, or attempt a cuisine you've never eaten before. 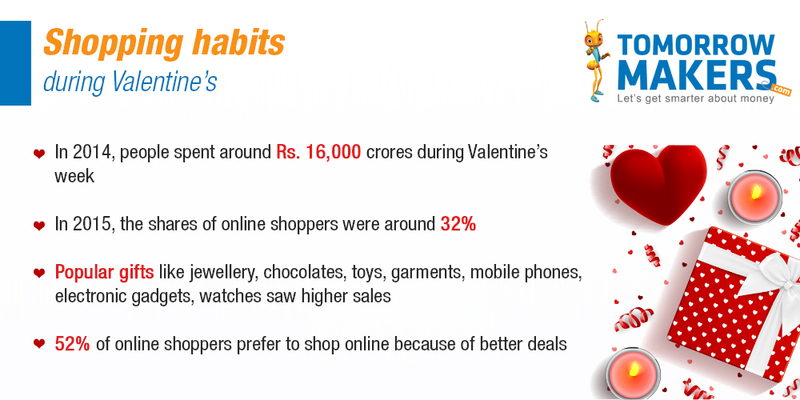 Check what offers your bank provides on credit and debit cards and plan your Valentine’s Day around them. That way, you’ll keep your expenses low, and the fun quotient high. One of the best perks of being a couple, apart from always having someone by your side, is the many couples offers you get on days like Valentine’s Day. A quick search online will give you numerous options to choose from, such as couple’s massages, dance lessons or cooking classes. Some of these might seem unconventional ways to spend the day, but that’s the great thing about being a couple; you always have someone to experiment these things with. More importantly, you can find tons of special packages, discounts and other value-added services which won’t empty your wallet. If you do want the whole romantic, weekend getaway, but also want to keep your expenses from spiralling, you can. It’s quite likely that tickets, travel packages, chocolates and flowers are going to be expensive on D-Day. So, postpone your Valentine’s Day celebrations for the following weekend, when prices will probably decrease as the excitement dies down. Not only will you see some savings, but you’ll also be able to avoid the crowds and get some space all to yourself. This will certainly be welcome if you are spending a lot of money on the holiday.